Austrian Import – Special album (not the regular 4th studio album) in a limited edition of strictly 300 copies! 11-cut new release that ranges from mid-tempo accordion neocabaret postfolk to mid 80’s New Wave and pop. Black painted catchy songs with Roma Amor trademark and more: smoky voice and emotional accordion next to drumbeat, weird percussions, piano and synth sounds. 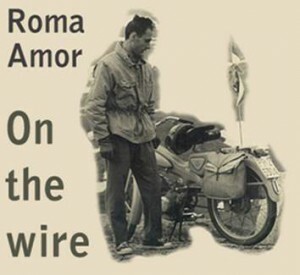 On The Wire includes the full SPQR 10” (17.3) from 2012, here remixed and remastered with slightly different vocals and arrangements on some tracks, plus 6 previously unreleased songs of dark-flavoured music brewed with a lot of influences. Comes in elegant creamy digipak with vintage biker photos in the Austrian Alps.